The installation of a Metrotile Lightweight Steel Roofing system is a swift, economical and ecological process made possible by the product’s lightweight design and use of modern construction materials. Whether you’re a self-builder, looking to install the roof on your own project or you’re looking for an approved contractor to carry out the work, Metrotile is there to help during every step of the installation process and beyond. The lightweight design of the Metrotile product is a plus factor for any installation; It ensures reduced transport costs and faster on-site deliveries, while the durable profile design enables the profiles to be moved around the site with virtually zero breakages, keeping waste to a minimum while ensuring the order quantities are accurately assessed. Installation on site may be carried out with the use of scaffolding, or via Cherry Picker if space is at a premium. Either way, the large Metrotile profile sheets are simply locked into place and nailed to the roof battens, utilising a dry-fix cross nail system that provides unsurpassed security and continues to keep on-site waste to a minimum. 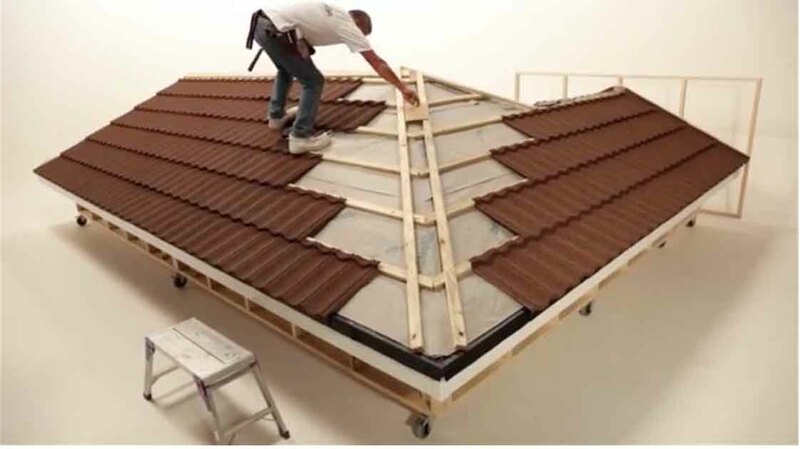 Tiles may be shaped, cut or formed to suit each individual roof design and can easily accommodate accessories such as roof windows, vents, solar tubes and the Metrotile Photovoltaic System, as well as simple or complex hip and valley arrangements. A dry-fix system has a number of advantages. It helps the speed of installation and reduces the need for ancillary materials to be ordered, stored and disposed of and it also ensures that installation is far less weather-dependant, helping to add certainty to the construction programme and ensuring a more efficient flow of internal trades. Detailed step-by-step installation guides are available for download below, with video installation guides available here. Metrotile Approved Contractors If your project requires the use of contractors, Metrotile will put you in touch with an approved contractor in your area. Please note that we are only able to guarantee roofing systems installed by an approved contractor, or self-installed roofs approved by a Metrotile representative.